Below is a timeline of each generation with the top three home video consoles of each generation based on worldwide sales. For a complete list of home video consoles released in each generation please see the respective article of each generation. – Unit with the highest sales of its generation. – Unit with the second highest sales of its generation. – Unit with the third highest sales of its generation. – Manufacturer released a home video console during this generation but did not sell the most units. – – Manufacturer didn't release a home video game console during this generation. † – Indicates the current generation consoles on the market. The Magnavox Odyssey was the first video game console, released in 1972. Although the first video games appeared in the 1950s, they were played on massive computers connected to vector displays, not analog televisions. Ralph H. Baer conceived the idea of a home video game in 1951. In the late 1960s while working for Sanders Associates he created a series of video game console designs. One of these designs, which gained the nickname of the "Brown Box", featured changeable game modes and was demonstrated to several TV manufactures ultimately leading to an agreement between Sanders Associates and Magnavox. In 1972 Magnavox released the Magnavox Odyssey, the first home video game console which could be connected to a TV set. Ralph Baer's initial design had called for a huge row of switches that would allow gamers to turn on and off certain components of the console (the Odyssey lacked a Central processing unit) to create slightly different games like tennis, volleyball, hockey, and chase. Magnavox replaced the switch design with separate cartridges for each game. Although Baer had sketched up ideas for cartridges that could include new components for new games, the carts released by Magnavox all served the same function as the switches and allowed gamers to choose from the Odyssey's built-in games. The Odyssey only initially sold about 100,000 units, making it moderately successful, and it was not until Atari's arcade game Pong popularized video games, that the public began to take more notice of the emerging industry. By autumn 1975, Magnavox, bowing to the popularity of Pong, cancelled the Odyssey and released a scaled-down version that played only Pong and hockey, the Odyssey 100. A second, "higher end" console, the Odyssey 200, was released with the 100 and added on-screen scoring, up to four players, and a third game—Smash. Almost simultaneously released with Atari's own home Pong console through Sears, these consoles jump-started the consumer market. All three of the new consoles used simpler designs than the original Odyssey with no board game pieces or extra cartridges. In the years that followed, the market saw many companies rushing similar consoles to market. After General Instrument released their inexpensive microchips, each containing a complete console on a single chip, many small developers began releasing consoles that looked different externally, but internally were playing exactly the same games. Most of the consoles from this era were dedicated consoles only playing the games that came with the console. These video game consoles were often just called video games, because there was little reason to distinguish the two yet. While a few companies like Atari, Magnavox, and newcomer Coleco pushed the envelope, the market became flooded with simple, similar video games. Fairchild released the Fairchild Video Entertainment System (VES) in 1976. While there had been previous game consoles that used cartridges, either the cartridges had no information and served the same function as flipping switches (the Odyssey) or the console itself was empty (Coleco Telstar) and the cartridge contained all of the game components. The VES, however, contained a programmable microprocessor so its cartridges only needed a single ROM chip to store microprocessor instructions. RCA and Atari soon released their own cartridge-based consoles, the RCA Studio II and the Atari 2600 (originally branded as the Atari Video Computer System), respectively. Both Bally (with their Home Library Computer in 1977) and Magnavox (with the Odyssey² in 1978) also brought their own programmable cartridge-based consoles to the market. However, it was not until Atari released a conversion of the golden age arcade hit Space Invaders in 1980 for the Atari 2600 that the home console industry took off. Many consumers bought an Atari console so they could play Space Invaders at home. Space Invaders' unprecedented success started the trend of console manufacturers trying to get exclusive rights to arcade titles and the trend of advertisements for game consoles claiming to bring the arcade experience home. Throughout the early 1980s, other companies released video game consoles of their own. Many of the video game systems were technically superior to the Atari 2600, and marketed as improvements over the Atari 2600, but Atari dominated the console market in the early 1980s. However, a severe crash occurred in 1983 in the video game business. The NES was the highest selling console in the history of North America and revitalized the video game market. Mario of Super Mario Bros. became a global icon starting with his NES games. Nintendo took an unusual stance with third-party developers for its console. Nintendo contractually restricted third-party developers to three NES titles per year and forbade them from developing for other video game consoles. The practice ensured Nintendo's market dominance and prevented the flood of trash titles that had helped kill the Atari, but was ruled illegal late in the console's life cycle. Sega's Master System was intended to compete with the NES, but never gained any significant market share in the US or Japan and was barely profitable. It fared notably better in PAL territories. In Europe and South America, the Master System competed with the NES and saw new game releases even after Sega's next-generation Mega Drive was released. In Brazil where strict importation laws and rampant piracy kept out competitors, the Master System outsold the NES by a massive margin and remained popular into the '90s. Jack Tramiel, after buying Atari, downsizing its staff, and settling its legal disputes, attempted to bring Atari back into the home console market. Atari released a smaller, sleeker, cheaper version of their popular Atari 2600. They also released the Atari 7800, a console technologically comparable with the NES and backwards compatible with the 2600. Finally Atari repackaged its 8-bit XE home computer as the XEGS game console. The new consoles helped Atari claw its way out of debt, but failed to gain much market share from Nintendo. Atari's lack of funds meant that its consoles saw fewer releases, lower production values (both the manuals and the game labels were frequently black and white), and limited distribution. NEC brought the first fourth-generation console to market with their PC Engine (later sold as the TurboGrafx-16 in North America) when Hudson Soft approached them with an advanced graphics chip. Hudson had previously approached Nintendo, only to be rebuffed by a company still raking in the profits of the NES. The TurboGrafx used the unusual HuCard format to store games. The small size of these proprietary cards allowed NEC to re-release the console as a handheld game console. The PC Engine enjoyed brisk sales in Japan, but its North American counterpart, the TurboGrafx, lagged behind the competition. The console never saw an official release in Europe, but clones and North American imports were available in some markets starting in 1990. NEC advertised their console as "16-bit" to highlight its advances over the NES. This started the trend of all subsequent fourth generations consoles being advertised as 16 bit. Many people still refer to this generation as the 16-bit generation, and often refer to the third generation as "8-bit". Sega scaled down and adapted their Sega System 16 (used to power arcade hits like Altered Beast and Shinobi) into the Mega Drive (or Genesis) and released it with a near arcade-perfect port of Altered Beast. Sega's console met lukewarm sales in Japan, but skyrocketed to first place in PAL markets, and made major inroads in North America. Propelled by its effective "Genesis does what Nintendon't" marketing campaign, Sega capitalized on the Genesis's technological superiority over the NES, faithful ports of popular arcade games, and competitive pricing. Arcade gaming company, SNK developed the high end Neo Geo MVS arcade system which used interchangeable cartridges similar to home consoles. Building on the success of the MVS, SNK repackaged the NeoGeo as the Neo Geo AES home console. Though technologically superior to the other fourth-generation consoles, the AES and its games were prohibitively expensive, which kept sales low and prevented it from expanding outside its niche market and into serious competition with Nintendo and Sega. The AES did, however, amass a dedicated cult following, allowing it to see new releases into the 2000s. The fourth generation graphics chips allowed these consoles to reproduce the art styles that were becoming popular in arcades and on home computers. These games often featured lavish background scenery, huge characters, broader color palettes, and increased emphasis on dithering and texture. Games written specifically for the NES, like Megaman, Shatterhand, and Super Mario Bros. 3 were able to work cleverly within its limitations. Ports of the increasingly detailed arcade and home computer games came up with various solutions. For example, when Capcom released Strider in the arcade they created an entirely separate Strider game for the NES that only incorporated themes and characters from the arcade. In 1990 Nintendo finally brought their Super Famicom to market and brought it to the US as the Super Nintendo Entertainment System (SNES) a year later. Its release marginalized the TurboGrafx and the Neo Geo, but came late enough for Sega to sell several million consoles in North America and gain a strong foothold. The same year the SNES was released Sega released Sonic the Hedgehog, which spiked Genesis sales, similar to Space Invaders on the Atari. Also, by 1992 the first fully licensed NFL Football game was released: NFL Sports Talk Football '93, which was available only on the Genesis. This impact on Genesis sales, and the overall interest of realistic sports games, would start the trend of licensed sports games being viewed as necessary for the success of a console in the US. While Nintendo enjoyed dominance in Japan, and Sega in Europe, the competition between the two was particularly fierce and close in North America. Ultimately, the SNES outsold the Genesis, but only after Sega discontinued the Genesis to focus on the next generation of consoles. One trait that remains peculiar to the fourth generation is the huge number of exclusive games. Both Sega and Nintendo were very successful and their consoles developed massive libraries of games. Both consoles had to be programmed in assembly to get the most out of them. A game optimized for the Genesis could take advantage of its faster CPU and sound chip. A game optimized for the SNES could take advantage of its graphics and its flexible, clean sound chip. Some game series, like Castlevania, saw separate system exclusive releases rather than an attempt to port one game to disparate platforms. When compact disc (CD) technology became available midway through the fourth generation, each company attempted to integrate it into their existing consoles in different ways. NEC and Sega released CD add-ons to their consoles in the form of the TurboGrafx-CD and Sega CD, but both were only moderately successful. NEC also released the TurboDuo which combined the TurboGrafx-16 and the TurboGrafx-CD add-on (along with the RAM and BIOS upgrade from the Super System Card) into one unit. SNK released a third version of the Neo-Geo, the Neo Geo CD, allowing the company to release its games on a cheaper medium than the AES's expensive cartridges, but it reached the market after Nintendo and Sega had already sold tens of millions of consoles each. Nintendo partnered with Sony to work on a CD addon for the SNES, but the deal fell apart when they realized how much control Sony wanted. Sony would use their work with Nintendo as the basis for their Playstation game console. While CDs became an increasingly visible part of the market, CD-reading technology was still expensive in the 90s, limiting NEC's and Sega's add-ons' sales. The original PlayStation became the most popular system of the fifth generation consoles, eventually selling over 100 million systems. The first fifth-generation consoles were the 3DO and the Atari Jaguar. Although both consoles were more powerful than the fourth generation systems, neither would become serious threats to Sega or Nintendo. The 3DO initially generated a great deal of hype in part because of a licensing scheme where 3DO licensed the manufacturing of its console out to third parties, similar to VCR or DVD players. Unfortunately, that very structure meant that unlike its competitors who could sell the console at a loss, all 3DO manufacturers had to sell for profit. The cheapest 3DO was more expensive than the Super NES and Genesis combined. Atari cancelled their line of home computers, their Atari Portfolio, the Stacy laptop, and their handheld Atari Lynx when they released the Jaguar. It was an all or nothing gamble that ran the company into the ground. The Jaguar had three processors and no C libraries to help developers cope with it. Atari was ineffective at courting third parties and many of their first party games were poorly received. While games like Tempest 2000, Rayman, and Alien vs Predator showed what the console was capable of, the vast majority of releases underwhelmed. Many of the Jaguar's games used mainly the slowest (but most familiar) of the console's processors, resulting in titles that could easily have been released on the SNES or Genesis. While the fourth generation had seen a handful of acclaimed titles on NEC's PC Engine CD-ROM² and Sega's Mega CD add-ons, it wasn't until the fifth generation that a CD-based consoles and games began to seriously compete with cartridges. CDs were significantly cheaper to manufacture and distribute than cartridges were, and gave developers room to add cinematic cut-scenes, pre-recorded soundtracks, and voice acting that made more serious storytelling possible. NEC had been developing a successor to the PC Engine as early as 1990, and presented a prototype, dubbed the "Iron Man," to developers in 1992, but shelved the project as the PC Engine managed to extend the console's market viability in Japan into the mid-90s. When sales started to dry up, NEC rushed its old project to the market. The PC-FX, a CD-based, 32-bit console, had highly advanced, detailed 2D graphics capabilities, and better full-motion video than any other system on the market. It was, however, incapable of handling 3D graphics, forfeiting its chances at seriously competing with Sony and Sega. The console was limited to a niche market of dating sims and visual novels in Japan, and never saw release in Western markets. After the abortive 32X, Sega entered the fifth generation with the Saturn. Sega released several highly regarded titles for the Saturn, but a series of bad decisions alienated many developers and retailers. While the Saturn was technologically advanced, it was also complex, difficult, and unintuitive to write games for. In particular, programming 3D graphics that could compete with those on Nintendo and Sony's consoles proved exceptionally difficult for third-party developers. Because the Saturn used quadrilaterals, rather than standard triangles, as its basic polygon, cross platform games had to be completely rewritten to see a Saturn port. The Saturn was also a victim of internal politics at Sega. While the Saturn sold comparably well in Japan, Sega's branches in North America and Europe refused to license localization of many popular Japanese titles, holding they were ill-suited to Western markets. First-party hits like Sakura Taisen never saw Western releases, while several third-party titles released on both PlayStation and Saturn in Japan, like Grandia and Castlevania: Symphony of the Night, were released in North America and Europe as PlayStation exclusives. Nintendo was the last to release a fifth generation console with their Nintendo 64, and when they finally released their console it came with only two launch titles. Partly to curb piracy and partly as a result of Nintendo's failed disc projects with Sony and Phillips, Nintendo used cartridges for their console. The higher cost of cartridges drove many third party developers to the PlayStation. The Nintendo 64 could handle 3D polygons better than any console released before it, but its games often lacked the cut-scenes, soundtracks, and voice-overs that became standard on PlayStation discs. Nintendo released several highly acclaimed titles, such as Super Mario 64 and The Legend of Zelda: Ocarina of Time, and the Nintendo 64 was able to sell tens of millions of units on the strength of first-party titles alone, but its constant struggles against Sony would make the Nintendo 64 the last home console to use cartridges as a medium for game distribution. 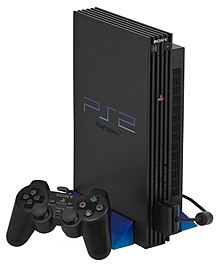 With more than 155 million units sold, the PlayStation 2 is the best selling videogame console in history. The sixth generation saw a move towards PC-like architectures in gaming consoles, as well as a shift towards using DVDs for game media. This brought games that were both longer and more visually appealing. Furthermore, this generation also saw experimentation with online console gaming and implementing both flash and hard drive storage for game data. Sega's Dreamcast was released in Japan on November 27, 1998, in North America on September 9, 1999, in Europe on October 14, 1999 and in Australia on November 30, 1999. It was the company's last video game console, and was the first of the generation's consoles to be discontinued. Sega implemented a special type of optical media called the GD-ROM. These discs were created in order to prevent software piracy, which had been more easily done with consoles of the previous generation; however, this format was soon cracked as well. It also sported a 33.6Kb or 56k modem which could be used to access the internet or play some of the games, like Phantasy Star Online, online, making it the first console with built-in internet connectivity. The Dreamcast was discontinued in March 2001, and Sega transitioned to software developing/publishing only. Nintendo's GameCube was released in Japan on September 15, 2001, in North America on November 18, 2001, in Europe on May 3, 2002 and in Australia on May 17, 2002. It was Nintendo's fourth home video game console and the first console by the company to use optical media instead of cartridges. The Nintendo GameCube did not play standard 12 cm DVDs, instead it employed smaller 8 cm optical discs. With the release of the Game Boy Player, all Game Boy, Game Boy Color, and Game Boy Advance cartridges could be played on the platform. The Nintendo GameCube was discontinued in 2007 with the release of Wii. Microsoft released its first games console, the Xbox in North America on November 15, 2001, in Japan on February 22, 2002, and in Europe and Australia on March 14, 2002. It was the first console to employ a hard drive right out of the box to save games, the first to include an Ethernet port for broadband internet, and the beginning of Microsoft's online Xbox LIVE service. Microsoft was able to attract many PC developers by using the NT kernel and DirectX from their Windows operating system. Though criticized for its bulky size and the awkwardness of its original controller, the Xbox eventually gained popularity, especially in the US, where it outsold the GameCube to secure second place, due in part to the success of the Halo franchise. The features introduced in this generation include the support of new disc formats: Blu-ray Disc, utilized by the PlayStation 3, and HD DVD supported by the Xbox 360 via an optional $200 external accessory addition, that was later discontinued as the format war closed. Another new technology is the use of motion as input, and IR tracking (as implemented on the Wii). Also, all seventh generation consoles support wireless controllers. Microsoft kicked off the seventh generation with the release of the Xbox 360 on November 22, 2005 in the United States, December 2, 2005 in Europe, December 10, 2005 in Japan and March 23, 2006 in Australia. It featured market-leading processing power until the Sony PlayStation 3 was released one year later. While the original Xbox 360 "Core" did not include an internal HDD, most Xbox 360 models since have included at least the option to have one. The Xbox 360 optical drive is a DVD9 reader, allowing DVD movies to be played. No Blu-ray drive was included, making big games like Battlefield and Grand Theft Auto V require two or more DVDs to play. Up to four controllers can be connected to the console wirelessly on the standard 2.4 GHz spectrum. There are 4 discontinued versions of the Xbox 360: the "Arcade," the "Pro," and the "Elite," and the newer "S" or 'slim' model. The currently shipping "E" version of the Xbox 360 includes 3 configurations: a 4 GB internal SSD version which acts like a USB hard drive, a 250 GB HDD version, and a branded 320 GB HDD version. The Xbox 360 is backward compatible with about half the games of the original Xbox library. In 2010, Microsoft released Kinect, allowing for motion-controlled games. Sony's PlayStation 3 was released in Japan on November 11, 2006, in North America on November 17, 2006 and in Europe and Australia on March 23, 2007. All PlayStation 3s come with a hard drive and are able to play Blu-ray Disc games and Blu-ray Disc movies out of the box. The PlayStation 3 was the first video game console to support HDMI output out of the box, using full 1080p resolution. Up to seven controllers can connect to the console using Bluetooth. There are 6 discontinued versions of the PS3: a 20 GB HDD version (discontinued in North America and Japan, and was never released in PAL territories), a 40 GB HDD version (discontinued), a 60 GB HDD version (discontinued in North America, Japan and PAL territories), 80 GB HDD version (only in some NTSC territories and PAL territories), a "slim" 120 GB HDD version (discontinued), and a "slim" 250 GB version (discontinued). The two current shipping versions of the PlayStation 3 are: a "slim" 160 GB HDD version and a "slim" 320 GB HDD version. The hard drive can be replaced with any standard 2.5" Serial ATA drive and the system has support for removable media storage, such as Memory Stick, Memory Stick Pro, Memory Stick Duo, Memory Stick PRO Duo, USB, SD, MiniSD, and CompactFlash (CF) digital media, but only the PlayStation versions up to 80 GB support this. The slim PlayStation 3 consoles (120 GB and up) had removable storage discontinued. All models are backward compatible with the original PlayStation's software library, and the launch models, since discontinued, are also backward compatible with PlayStation 2 games. As a cost-cutting measure, later models removed the Emotion Engine, making them incompatible with PS2 discs. In 2010, Sony released PlayStation Move, allowing for motion-controlled games. With recent software updates, the PlayStation 3 can play 3D Blu-ray movies and 3D games. Nintendo's Wii was released in North America on November 19, 2006, in Japan on December 2, 2006, in Australia on December 7, 2006 and in Europe on December 8, 2006. It is bundled with Wii Sports in all regions except for Japan. Unlike the other systems of the seventh generation, the Wii does not support an internal hard drive, but instead uses 512 MB of internal Flash memory and includes support for removable SD card storage. It also has a maximum resolution output of 480p, making it the only seventh generation console not able to output high-definition graphics. Along with its lower price, the Wii is notable for its unique controller, the Wii Remote, which resembles a TV remote. The system uses a "sensor bar" that emits infrared light that is detected by an infrared camera in the Wii Remote to determine orientation relative to the source of the light. All models, other than the Wii Family Edition and the Wii Mini, are backwards compatible with Nintendo GameCube games and support up to four Nintendo GameCube controllers and two memory cards. It also includes the Virtual Console, which allows the purchase and downloading of games from older systems, including those of former competitors. In 2009, Nintendo introduced the 'Wii MotionPlus' expansion, which uses the same technology as the console previously used, but with enhanced motion tracking and sensing to improve gameplay quality. The Wii has four colors: white, blue, black, and red. Current models include Wii Sports, Wii Sports Resort, and Wii Motion Plus. Aside from the usual hardware enhancements, consoles of the eighth generation focus on further integration with other media and increased connectivity. The Wii U introduced a controller/tablet hybrid whose features include the possibility of augmented reality in gaming. The PlayStation 4 is Sony's eighth generation console, featuring a "share" button to stream video game content between devices, released on November 15, 2013. Microsoft released their next generation console, the Xbox One, on November 22, 2013. Game systems in the eighth generation also faced increasing competition from mobile device platforms such as Apple's iOS and Google's Android operating systems. Smartphone ownership was estimated to reach roughly a quarter of the world's population by the end of 2014. The proliferation of low-cost games for these devices, such as Angry Birds with over 2 billion downloads worldwide, presents a new challenge to classic video game systems. Microconsoles, cheaper stand-alone devices designed to play games from previously established platforms, also increased options for consumers. Many of these projects were spurred on by the use of new crowdfunding techniques through sites such as Kickstarter. Notable competitors include the GamePop, OUYA, and GameStick Android-based systems, the PlayStation Vita TV, and the forthcoming Steam Machine. Despite the increased competition, the sales for major console manufacturers featured strong starts. The PlayStation 4 sold 1 million consoles within 24 hours in 2 countries, whilst the Xbox One sold 1 million consoles within 24 hours in 13 countries. As of April 2014, 7 million Playstation 4 consoles have been sold worldwide, and 5 million Xbox One units have shipped, both outpacing sales of their seventh generation systems. In May, Nintendo announced that it had sold only 2.8 million Wii U consoles, falling far short of their forecasts. In 2016, both Microsoft and Sony announced hardware refreshes of their respective consoles, which all aim to futureproof their platforms and provide improved support for 4K ultra high-definition content and virtual reality. Nintendo discontinued production of the Wii U in January 2017, and released a new "hybrid" console, the Nintendo Switch, in March 2017. The Switch can be used as either a handheld tablet or docked for use on televisions. ^ The Atari 2600 sold 30 million units during its life-cycle. Atari also released a second home console during the second generation known as the Atari 5200 which sold 1 million units. ^ The Atari 7800 sold 1 million units. Atari also released the Atari XEGS during the third generation which sold 100,000 units. ^ Coleco launched Telstar in 1976 and sold a million. Production and delivery issues, and dedicated consoles being replaced by electronic handheld games dramatically reduced sales in 1977. Over a million Telstars were scrapped in 1978, and it cost Coleco $22.3 million that year—almost bankrupting the company. ^ The ColecoVision reached 2 million units sold by the spring of 1984. Console quarterly sales dramatically decreased at this time, but it continued to sell modestly with most inventory gone by October 1985. ^ As of January 30, 2019 the Nintendo Switch has sold 32.27 million units. Nintendo also released the Wii U during the eighth generation which sold 13.56 million units during its lifecycle. ^ 10–13 million, not including recent Brazil sales figures. Screen Digest wrote in a 1995 publication that the Master System's active installed user base in Western Europe peaked at 6.25 million in 1993. Those countries that peaked are France at 1.6 million, Germany at 700 thousand, the Netherlands at 200 thousand, Spain at 550 thousand, the United Kingdom at 1.35 million, and other Western European countries at 1.4 million. However, Belgium peaked in 1991 with 600 thousand, and Italy in 1992 with 400 thousand. Thus it is estimated approximately 6.8 million units were purchased in this part of Europe. 1 million were sold in Japan as of 1986. 2 million were sold in the United States. 8 million were sold by Tectoy in Brazil as of 2016. ^ 30.75 million sold by Sega worldwide as of March 1996, not including third-party sales. In addition, Tec Toy sold 3 million in Brazil, and Majesco Entertainment projected it would sell 1.5 million in the United States. ^ Sources for Dreamcast worldwide sales. ^ Designed by Hudson and manufactured and marketed by NEC. ^ a b Sony stopped divulging individual platform sales starting with 2012 fiscal reports, and continues to sporadically. PlayStation 2: 138.8 million units sold as of Sony's first fiscal quarter ending June 2009 (Q1 FY2009). Sony sold 16.2 million units from Q2 FY2009 until March 31, 2012. It was discontinued worldwide on January 4, 2013. PlayStation 3: A Sony press release reported 80 million sold as of November 2, 2013. 3.4 million were shipped in 2014 and 0.4 million in the first quarter of 2015. ^ a b Starting with Microsoft's fiscal quarter ending June 2014 (Q4), the company stopped divulging individual platform sales in their fiscal reports. Microsoft stated it will shift focus to the amount of active users on Xbox Live starting in late 2015. Xbox 360: Sold 84 million as of June 2014. Xbox One: Microsoft CEO Satya Nadella unveiled at a December 3, 2014 shareholder presentation that 10 million units were sold. Third-party estimates suggest sales reached approximately 25-30 million worldwide by late 2016. Video game industry analyst Daniel Ahmad estimated that approximately 41 million units had been sold through 2018. ^ Ellis, David (2004). "Dedicated Consoles". Official Price Guide to Classic Video Games. Random House. pp. 33–36. ISBN 0-375-72038-3. ^ Kent, Steven (2001). "Strange Bedfellows". Ultimate History of Video Games. Three Rivers Press. pp. 94–95. ISBN 0-7615-3643-4. ^ "AtGames to Launch Atari Flashback 4 to Celebrate Atari's 40th Anniversary!" (Press release). PR Newswire. November 12, 2012. Archived from the original on November 27, 2012. Retrieved April 11, 2014. ^ Schrage, Michael (May 22, 1984). "Atari Introduces Game In Attempt for Survival". The Washington Post: C3. ISSN 0190-8286. Retrieved July 29, 2009. (Subscription required (help)). The company has stopped producing its 5200 SuperSystem games player, more than 1 million of which were sold. 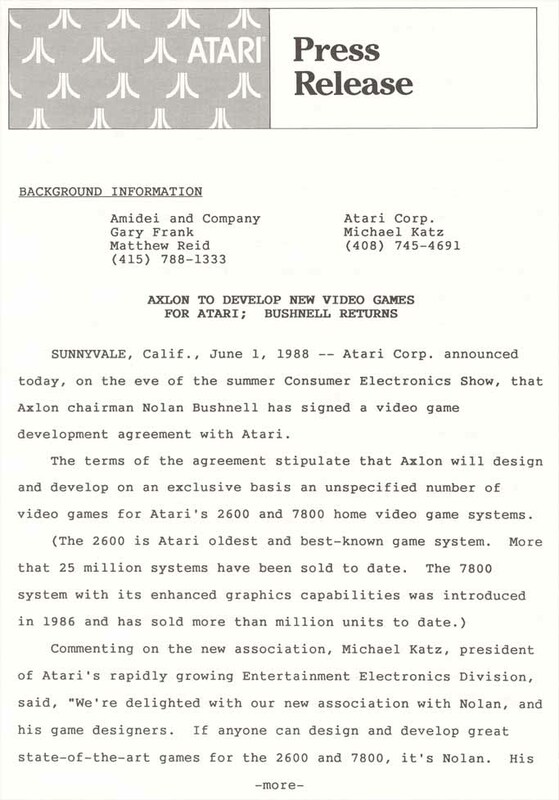 ^ "Editorial: Ever-Changing Atari Marketplace". Atarimagazines.com. Retrieved 2018-01-10. ^ Orlando, Greg (May 15, 2007). "Console Portraits: A 40-Year Pictorial History of Gaming". Wired News. Condé Nast Publications. Archived from the original on December 23, 2008. Retrieved March 23, 2008. ^ a b Kleinfield, N. R. (July 21, 1985). "Coleco Moves Out Of The Cabbage Patch". The New York Times. p. F4. Retrieved January 13, 2014. Coleco is now debating whether to withdraw from electronics altogether. Colecovision still sells, but it is a shadow of its former self. ^ Mehegan, David (May 8, 1988). "Putting Coleco Industries Back Together". The Boston Globe. p. A1. ISSN 0743-1791. Archived from the original on September 24, 2015. Retrieved April 23, 2014. (Subscription required (help)). When the game [Telstar] crashed hard, earnings fell 50 percent in 1977 and the company lost $22 million in 1978, barely skirting bankruptcy after Handel -- then chief financial officer -- found new credit and mollified angry creditors after months of tough negotiation. ^ "Coleco Industries sales report" (Press release). PR Newswire. April 17, 1984. Archived from the original on November 4, 2013. Retrieved November 3, 2013. 'First quarter sales of ColecoVision were substantial, although much less that [sic] those for the year ago quarter,' Greenberg said in a prepared statement. He said the company has sold 2 million ColecoVision games since its introduction in 1982. ^ "Coleco's Net In Sharp Rise". The New York Times. Associated Press. October 19, 1985. p. 45. ISSN 0362-4331. Retrieved January 13, 2014. Thursday, Coleco said the entire inventory of its troubled Adam personal computer has been sold, along with much of its Colecovision inventory. The company's chairman, Arnold Greenberg, said Coleco expects no more charges against earnings from the two discontinued products. ^ Sheff, David; Eddy, Andy (1999), Game Over: How Nintendo Conquered the World, GamePress, p. 27, ISBN 978-0-9669617-0-6, Nintendo entered the home market in Japan with the dramatic unveiling of Color TV Game 6, which played six versions of light tennis. It was followed by a more powerful sequel, Color TV Game 15. A million units of each were sold. The engineering team also came up with systems that played a more complex game, called "Blockbuster," as well as a racing game. Half a million units of these were sold. ^ a b c d e f "Historical Data: Consolidated Sales Transition by Region" (xlsx). Nintendo. April 27, 2017. Retrieved April 27, 2017. ^ "Consolidated Financial Highlights - Q1 FY2019" (PDF). Nintendo. January 31, 2019. Retrieved August 14, 2018. ^ "Magnavox Odyssey, the first video game system". Pong-Story. June 27, 1972. Retrieved November 17, 2012. ^ "Top 25 Video Game Consoles of All Time (Magnavox Odyssey 2)". IGN. Archived from the original on September 8, 2009. Retrieved October 31, 2013. ^ Snow, Blake (July 30, 2007). "The 10 Worst-Selling Consoles of All Time". GamePro. p. 2. Archived from the original on May 8, 2007. Retrieved October 25, 2008. ^ "Intellivision: Intelligent Television". GameSpy. Archived from the original on October 23, 2013. Retrieved October 31, 2013. ^ Buchanan, Levi (March 20, 2009). "Genesis vs. SNES: By the Numbers". IGN. Retrieved October 31, 2013. Nintendo moved 49.1 million Super NES consoles over the course of the generation and beyond, far surpassing the Genesis, which sold a still impressive 29 million units. [...] The Master System sold an anemic 13 million to the NES count of 62 million. ^ Forster, Winnie (2005). The Encyclopedia of Game.Machines: Consoles, Handhelds, and Home Computers 1972–2005. Magdalena Gniatczynska. p. 139. ISBN 3-00-015359-4. ^ Nihon Kōgyō Shinbunsha (1986). "Amusement". Business Japan. Nihon Kogyo Shimbun. 31 (7–12): 89. Retrieved January 24, 2012. ^ Azevedo, Théo (May 12, 2016). "Console em produção há mais tempo, Master System já vendeu 8 mi no Brasil" (in Portuguese). Universo Online. Retrieved May 13, 2016. Comercializado no Brasil desde setembro de 1989, o saudoso Master System já vendeu mais de 8 milhões de unidades no país, segundo a Tectoy. ^ "Yearly market report". Famitsu Weekly (in Japanese) (392): 8. June 21, 1996. ^ a b c Ernkvist, Mirko (August 21, 2012). Zackariasson, Peter; Wilson, Timothy, eds. The Video Game Industry: Formation, Present State, and Future. Routledge. p. 158. ISBN 978-1-136-25824-4. Retrieved December 5, 2015. ^ Sponsel, Sebastian (November 16, 2015). "Interview: Stefano Arnhold (Tectoy)". Sega-16. Retrieved November 21, 2015. ^ "Sega farms out Genesis". Consumer Electronics. March 2, 1998. Archived from the original on July 9, 2012. ^ "Sega Corporation Annual Report 2001" (PDF). Sega Corporation. August 1, 2001. p. 14. Retrieved November 2, 2015. A total of 3.39 million hardware units and 23.87 million software units were sold worldwide during fiscal 2001, for respective totals of 8.20 million units and 51.63 million units since Dreamcast was first brought to market. ^ "Revisions to Annual Results Forecasts" (PDF). Sega Corporation. October 23, 2001. p. 4. Archived from the original (PDF) on 2015-07-26. Retrieved November 2, 2015. Regarding sales of Dreamcast hardware from inventory resulting from the withdrawal from Dreamcast production [...] the Company exceeded initial targets with domestic sales of 130,000 units and U.S. sales of 530,000 units for the first half. Consequently, at the end of the half, Dreamcast inventories totaled 40,000 units domestically and 230,000 units for the United States, and we anticipate being able to sell all remaining units by the holiday season as initially planned. ^ "Sega Corporation Annual Report 2002" (PDF). Sega Corporation. July 1, 2002. p. 6. Retrieved November 2, 2015. The year ended March 31, 2002 was a turning point for Sega. We exited the hardware business, ceasing production of Dreamcast and selling through the remaining inventory. ^ Nutt, Christian. "Stalled engine: The TurboGrafx-16 turns 25". Gamasutra. Archived from the original on January 1, 2016. Retrieved August 13, 2016. ^ "PlayStation Cumulative Production Shipments of Hardware". Sony Computer Entertainment. Archived from the original on May 24, 2011. Retrieved October 31, 2013. ^ "Business Development: Hardware". Sony Computer Entertainment. Archived from the original on June 30, 2013. Retrieved October 28, 2013. ^ "Business Development: Unit Sales of Hardware(FY2013-)". Sony Computer Entertainment. Archived from the original on April 24, 2015. Retrieved April 30, 2015. ^ Makuch, Eddie (February 6, 2014). "PS4 helps Sony's game division rise, but PS3 sales see "significant decrease"". GameSpot. Retrieved December 13, 2015. ^ "PlayStation 2 Worldwide Hardware Unit Sales". Sony Computer Entertainment. Archived from the original on November 1, 2013. Retrieved February 23, 2013. ^ Stuart, Keith (January 4, 2013). "PlayStation 2 manufacture ends after 12 years". The Guardian. Retrieved November 22, 2013. ^ "PlayStation 3 Sales Reach 80 Million Units Worldwide" (Press release). PR Newswire. November 6, 2013. Retrieved November 6, 2013. ^ "Sony Consolidated Historical Data 2012-2014 (Unaudited)" (xlsx). Sony. August 1, 2017. p. 7. Archived from the original on April 17, 2018. Retrieved April 16, 2018. ^ "Sony Consolidated Historical Data 2015-2017 (Unaudited)" (xlsx). Sony. April 27, 2018. p. 9. Archived from the original on April 27, 2018. Retrieved April 16, 2018. ^ "Gamers Catch Their Breath as Xbox 360 and Xbox Live Reinvent Next-Generation Gaming". Xbox.com. May 10, 2006. Archived from the original on July 9, 2007. Retrieved September 5, 2007. ^ "Earnings Release FY14 Q3". Microsoft. April 24, 2014. Retrieved April 24, 2014. Microsoft sold in 2.0 million Xbox console units, including 1.2 million Xbox One consoles. ^ "Earnings Release FY14 Q4". Microsoft. July 22, 2014. Retrieved August 13, 2014. We sold in 1.1 million consoles in the fourth quarter, as we drew down channel inventory, compared to 1.0 million consoles during the prior year. ^ Futter, Mike (October 22, 2015). "[Update] Microsoft Will Focus Primarily On Xbox Live Usership, Not Console Shipments". Game Informer. Retrieved October 22, 2015. ^ Makuch, Eddie (June 9, 2014). "E3 2014: $399 Xbox One Out Now, Xbox 360 Sales Rise to 84 million". GameSpot. Archived from the original on October 13, 2014. Retrieved August 12, 2014. ^ "Microsoft Annual Meeting of Shareholders". Microsoft. December 3, 2014. Archived from the original on 2016-11-30. Retrieved January 31, 2015. Finally, our gaming business is thriving with the Xbox One hitting 10 million units sold. I am thrilled to welcome Mojang and Minecraft community to Microsoft. ^ Souppouris, Aaron (December 7, 2016). "Sony has sold 50 million PlayStation 4s". Engadget. Retrieved December 9, 2016. ^ "The First Video Game". Brookhaven National Laboratory, U.S. Dept. of Energy. Retrieved 2008-04-15. ^ Baer, Ralph H. (2005). Videogames: In The Beginning. Rolenta Press. pp. 52–59. ISBN 0-9643848-1-7. ^ "How Video Games Invaded the Home TV Set". Ralph H. Baer Consultants. Retrieved 2014-10-15. ^ "Master System Console in Brazil". April 29, 2013. Archived from the original on March 13, 2013. Retrieved April 29, 2013. ^ "Hirai targets 150 million PS3 sales". GamesIndustry.biz. 2008-07-21. Retrieved 2008-07-21. ^ "Hirai wants PS3 to beat PS2". Eurogamer. 2008-07-21. Retrieved 2008-07-21. ^ "What are the types of removable storage media is supported by the PlayStation 3 computer entertainment system?". Sony. Archived from the original on 2012-07-13. Retrieved 2009-07-03. ^ "Next Gen Consoles: Too much connectivity – Blog by flavi0 – IGN". IGN. ^ "Why you should wait on a Wii U (review) – GamesBeat – Games – by Rus McLaughlin". VentureBeat. ^ "Next Gen Xbox Reveal Confirmed for May 21". Den of Geek!. 2013-04-24. Retrieved 2013-04-24. ^ "Smartphone Users Worldwide Will Total 1.75 Billion in 2014". emarketer.com. ^ "New Two due". GamesRadar+. ^ "Valve says no Steam Machines until 2015, fingers crossed". theregister.co.uk. ^ "Sony sells 1 million PlayStation 4 units in first 24 hours". Reuters. November 17, 2013. ^ "PS4 Sales Surpass 7 Million Globally". PlayStation.Blog. ^ Thier, Dave (17 April 2014). "Microsoft Breaks Silence On Xbox One Sales...Sort Of". Forbes. ^ "World". NST Online. Archived from the original on 2014-05-31. ^ "Sony's new PlayStation 4 Pro can't play 4K Blu-rays". The Verge. Vox Media. Retrieved 7 September 2016. ^ "Sony announces PlayStation 4 Pro with 4K HDR gaming for $399". The Verge. Vox Media. Retrieved 7 September 2016. ^ "The PlayStation 4 Pro vs. the original PS4: What's changed?". Engadget. Retrieved 7 September 2016. ^ Souppouris, Aaron (June 14, 2016). "It's never been harder to buy an Xbox One". Engadget. Retrieved June 14, 2016. ^ Parfitt, Ben (June 15, 2016). "4K won't be mandatory for Xbox Scorpio games". MCV. Retrieved June 15, 2016. ^ Ashcraft, Brian (January 31, 2017). "Wii U Production Has Officially Ended For Japan [Update]". Kotaku. Retrieved January 31, 2017. ^ "Want to Buy the Nintendo Switch In India? You Need to Read This First". Gadgets 360. January 20, 2017. Archived from the original on March 4, 2017. Retrieved March 4, 2017.